Hands-on: LG G Pro 2 review | What Hi-Fi? LG decided against a big MWC 2014 unveil for the LG G Pro 2, instead giving it a standard press release welcome just over a week before the show. We’re not entirely sure why though – this is every bit the flagship device, and LG’s direct competition with Samsung’s Galaxy Note 3. We got hands on with it at the LG booth to see whether it’s something for Samsung to be worried about. The G Pro 2’s design is very similar to the original G Pro, except it takes a jump up in screen size from 5.5in to 5.9in. It's largely made from plastic, with the back panel taking on a textured feel – it won't be to everyone's liking, but it does help keep its weight to a relatively light 172g, just a few grams heavier than the Note 3. From the front, there are no physical buttons, and none on the sides of the phone either for that matter. Instead, the G Pro 2 sports the back-mounted buttons that we've seen on LG's G2 and G Flex. We found in our tests that we were quite taken by this placement, particularly in devices of this size, though it does take a little while to get used to. Under the hood of the G Pro 2 is a 2.26GHz quad-core Snaprdragon 800 processor and 3GB of RAM. The Sony Xperia Z2 just pips it on spec thanks its inclusion of the new 801 processor, but the 3GB of RAM could well give the performance edge over the 2GB Samsung Galaxy S5. We'll have to wait and see in our full review. On board storage options will be 16GB or 32GB but there is a microSD card slot for expanding this by an extra 64GB. Its battery matches the Note 3 at 3200mAh, so we'd expect up to a day or so battery life for all but the heavy power users, and it runs Android 4.4 too. 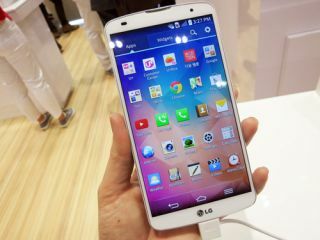 The 5.9in screen features IPS LCD technology, meaning better viewing angles than the likes of AMOLED. Its resolution is a 1920 x 1080 full HD, which puts it on a par with the Note 3, though its 373pi falls just behind the Note's 386ppi. We'd like to see you tell the difference, though. The screen is sharp, bright and vibrant, with no visible pixels. We'll look forward to seeing how it performs in our in-house video tests. The G Pro 2 does well to take a number of the headline features from some of MWC's biggest announcements and bring them into one handset. For example, it offers the 4K video recording that the Sony Xperia Z2 and Samsung Galaxy S5 offer, for filming at 3840 x 2160, and also has a 'selective focus' mode like the S5 too, here called Magic Focus. This allows you to take a photo and afterwards, touch an item to bring it into focus. It's effective and makes for quite impressive looking shots from the phone's 13MP camera. Another camera-based feature is the device's on-board advanced optical image stabilisation, or OIS+. This is said to build upon the OIS we saw in the G2 (and unfortunately not in the G Flex) to allow for even shakier shots to be stabilised. This was demonstrated with the G Pro 2 and two 'competitors', which looked awfully like the S4 and iPhone 5s, secured onto a vibrating board so you could test them out. The results certainly (and unsurprisingly) showed the G Pro 2 to come out on top, offering pretty impressive results for the conditions. Elsewhere, the camera flash has been improved using a feature called 'Natural Flash', which will take one picture without the flash, and one with, then combine them to create more natural, less overblown results. One of the most interesting new additions is a feature called Knock Code - something that builds on the company's Knock On feature, that we've seen on the G2 and G Flex. This allowed you to simply tap the screen twice to wake it from standby, no button presses required. Knock Code takes this a step further, and aims to cut down the time it takes you to get to into your phone. Instead of using Knock On and then having to enter a password, Knock Code combines these, by allowing you to create a pattern of between two and eight taps in place of a numerical PIN. LG says this allows for over 84,000 combinations, making it much more secure. You can enter your Knock Code wherever you like on the screen, and when we used it, it was responsive and effective each time. A clever feature indeed, and one that will also be rolling out to some LG handsets (we'd expect the G2 and G Flex to be included in that) via a software update soon. As for music, there's no high-res smarts here unfortunately, but we'll look forward to testing its performance all the same as soon as we can get our hands on a review sample. We really liked our time with the G Pro 2, which made us even more disappointed when we learned it hasn't been confirmed for UK launch just yet. Still, LG said this about the LG G Pro around the same time last year, and a few months later it materialised, so we're staying quietly positive. While its hardware doesn't push the bar much higher than what's already out there, LG has done a lot of work on the software, making it a great device to use, but also filling it full of interesting and usable features as well. It doesn't have the stylus of the Note 3, so that might be a consideration for some, but for those looking for a finger-friendly phablet, the LG G Pro 2 is a serious contender.